In a kingdom faced with civil war, an idealistic prince must abandon the foreign princess he desires for an arranged marriage to an influential knight. Together, the prince and knight travel north to deal with an army marching on the kingdom’s borders, only to discover the biggest threat to the crown is the princess they left behind. 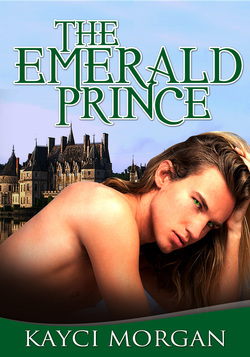 Prince Elliot had everything—wealth, power, the love of a beautiful woman. It wasn’t enough. More than anything he wanted to prove himself worthy of his crown. When negotiations for his sister's arranged marriage to Sir Blaine fell apart, he was asked to take her place and marry the knight. Sir Blaine was adored throughout the kingdom for his strategic mind and feats of bravery. He was rewarded with the greatest gift a king could offer a knight—the princess’s hand in marriage. But Blaine found the brazen Prince Elliot far more enticing. Elliot raised his wine glass to be refilled as Princess Zariya spoke cheerfully about her day. Zariya’s presence made the world shine more brightly. An exotic princess from across the sea, she was desired by every man at court, but it was Prince Elliot who was graced with the pleasure of her company. Issi, a servant girl, stepped forward and refilled his glass. Elliot couldn’t help but notice the strawberry curls that peaked from under her headscarf and how starkly it contrasted with Zariya’s long dark mane, which she allowed to hang free over her shoulders. But both were beautiful in their own unique way. The same with Issi’s skin; he’d seen her pale milky skin a thousand times and never noticed, except now how it contrasted with Zariya’s caramel tone. Zariya was different in so many ways, yet shockingly beautiful in each of them, which made Elliot more appreciative of beauty, even that of servant girls. Elliot’s head snapped up from Issi’s ample bosom to Zariya’s steady amber eyes. He clawed his mind for a response that would save him. He knew exactly how this would go; he’d seen it happen far too many times with Entia ladies at court. Zariya would throw things, possibly pour the jug of wine over his head, and then stomp from the room in disgust. He would spend the next week outside her door, his arms full of gifts while begging for forgiveness. Issi didn’t move as Zariya casually undressed her. Elliot was more than a little surprised. Entian women placed a high value on their virtue. He was certain Issi would refuse. After all, part of what made his Fezami princess so wonderfully different from all other women he’d ever met was how comfortable she was with her sexuality. Even though she was now in a country where everyone dressed conservatively, she still wore the light silks native to her own country. Some of the ladies of court found this scandalous. Elliot discovered he loved scandal. With her permission, Elliot stood up and kissed Issi, overwhelmed by the passion and adventure Zariya brought into his life. A few moments later, the doors to his bedchamber swung open, and Elliot cursed Tannis as the worst guard in history. “Can you believe…” Victoria words trailed off when she noticed her brother’s sleeping arrangement. Victoria moved her mouth but no words came out, just incomprehensible sounds. Without a hint of shame, Zariya climbed off of Elliot and picked her dress up off the floor. She wrapped the silk around her body, tying it with expertise before heading to the door. Issi scurried out behind her, head bowed, face red, with the covers tied around her and her dress bundled up in her arms. Elliot knew she was imagining her wedding night with Sir Blaine, a knight revered throughout the kingdom for his feats of bravery and his prowess with a sword. If he were even half as good at pleasing women as he was at killing things, Victoria would be a very happy wife. Elliot could only dream of such a fate. Zariya, his wife, and carrying his child. The gods couldn’t be so kind. With his elder sister being married in two days, he knew he’d be forced to marry soon after, and while Zariya was of royal blood, she’d lost her kingdom. She had no wealth, no army, no power. She fled from her land and was now living in Tys under his father’s protection. She was meant to be little more than an interesting diversion for court. The foreign princess with a tragic tale. Father would never let her become the next queen. There was nothing cheap about Zariya, but Elliot knew once Victoria had made her mind up about something or someone there was no changing it. It would have been a waste of effort to even try. So he just gritted his teeth through the constant insults. In a few days, she’d be married off, and he wouldn’t have to listen to her self-righteous rambling anymore. Elliot counted the days until his sister was married off.